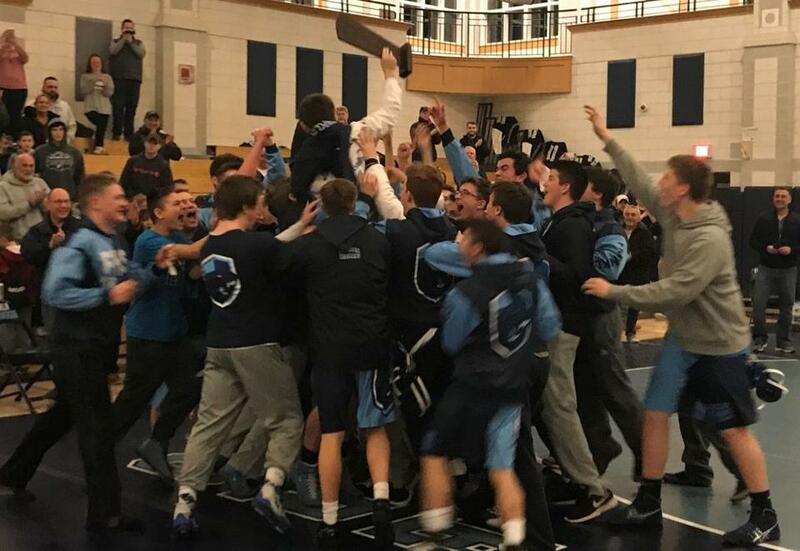 Mike Racca hoists the hardware as his Franklin wrestling teammates hoist him on their shoulders after the 145-pound senior led the Panthers to the Division 1 Coaches Dual Meet state title on Saturday. FRANKLIN — Wrestling at 145 pounds, Franklin senior Mike Racca had three pins to power the Panthers to the state title in the Division 1 Coaches Duals in front of his home crowd on Saturday afternoon. Franklin dominated the day, defeating Chelmsford in the finals, 53-13. Chelmsford jumped out to an early 7-0 lead, but Franklin took control after that. Racca, who was penciled into the middle of Franklin’s lineup, recorded a pin as the Panthers pushed their lead to 23-7 and never looked back. “Every time I go out there, I’m trying to get six points,” said Racca. He accomplished that goal in every match, first in a dominant 64-9 victory over Lawerence in the quarterfinals. In the semifinals vs. St. John’s Prep, Franklin coach Carmine Colacesaid Racca’s pin against Achilles Gikas provided the emotional boost the Panthers needed to reach the finals..
After leading the Panthers to a 59-11 victory over the Prep, Racca was scheduled to match up against Chelmsford’s Evan Goodall in the finals. Unfortunately, Goodall sustained a scary neck injury in his semifinal match against Shawsheen Tech’s Tom Strow . Goodall was taken off the mat on a stretcher and evaluated by EMTs, but did not need to go to the hospital and returned to cheer his teammates in the finals. For Colace’s seniors, finally winning the Coaches Duals was a dream come true. In North Andover, Central Catholic took down top-seeded North Attleboro in the finals to take home the dual meet state title. With three matches to go, and the Raiders trailing the Rockeeters, 30-24, sophomore Mikey Glynn picked up the pin at 106 pounds to tie things up. Junior Greg Spero’s 9-5 win at 113 pounds gave Central Catholic a 33-30 lead, and sophomore Nate Vachon clinched the title win with a 10-8 victory at 120 pounds. Glynn finished with three pins on the day, helping to pace the Raiders (18-2). At Ashland, top-seeded Foxboro defeated second-seeded Dedham in the finals, 30-27, to repeat as state dual meet champions. The dual came down to the final matchas 113-pound junior Adam Lanctot broke a 27-27 tie with a a 6-0 decision to clinch the title for the Warriors. David Austin Bumpus contributed to this report. For more highlights, go to bostonglobe.com/schools.